Durham, NC—The David M. Rubenstein Rare Book & Manuscript Library at Duke University has acquired one of the largest and most significant private collections on women’s history, documenting the work and intellectual contributions of women from the Renaissance to the modern era. The materials range in date from a 1240 manuscript documenting a respite home for women in Italy to a large collection of letters and manuscripts by the 20th-century anarchist Emma Goldman. Most materials were created between the mid-15th and mid-20th centuries. Other highlights include correspondence by legendary American and English suffragists and abolitionists Susan B. Anthony, Elizabeth Cady Stanton, Emmeline Pankhurst and Lucretia Mott; Harriet Beecher Stowe’s publicity blurb for Narrative of Sojourner Truth, written with Stowe’s own hand; decorated bindings by the celebrated turn-of-the-century British binders Sarah Prideaux, Katharine Adams and Sybil Pye; and Woolf’s writing desk, which the author designed herself. Baskin and her late husband, the artist Leonard Baskin, were both avid book collectors. Leonard also founded The Gehenna Press, one of the preeminent American private presses of the 20th century. Lisa Unger Baskin began collecting materials on women’s history in the 1960s after attending Cornell University. She is a member of the Grolier Club, the oldest American society for bibliophiles. For more information about the Lisa Unger Baskin Collection click here. 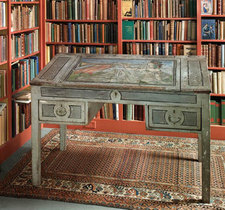 First image: Virginia Woolf's writing desk, painted by her nephew Quentin Bell. Second image: First folio edition of Maria Sibylla Merian's De Europische Insecten, 1730, Lisa Unger Baskin Collection, Rubenstein Library, Duke University.